Let's face it, when we talk about printers, we just think of them as good for what they are---printing. We don't look at printers the same way we do at cell phones, which is look for one that can match your style or good to show off to your friends. 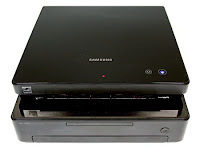 The Samsung ML-1630 would change the way we look at printers when it comes to design. If you're office is all about style, the Samsung ML-1630 is the perfect laser printer to complement your Mac PC or Gateway One. It has a sleek, glossy black finish enhanced by Blue LED lights. The Samsung ML-1630 is so pretty you want to take it around with you. It's fairly easy to set-up, and quite portable, not in the sense that you can carry it with you to complement your laptop, but easy enough to transfer from room to room. It also has a fairly low printing noise level. Text print out is mediocre but suitable for business needs and ink consumption of the Samsung ML-1630 is average compared with other printers of the same price. Style aside, the Samsung ML-1630 is rather slow compared to other laser printers of the same price range. I was also disappointed with the paper tray capacity on this machine, only 100 pages and it does not take legal sized paper. Another disappointment of the Samsung ML-1630 is that you can't print business cards or envelopes as it doesn't support thick paper lest you want to encounter frequent paper jams. The Samsung ML-1630 is hands down the prettiest printer I've ever seen and if your business is all about fashion, design, and style, this printer would be a great addition to your office space, however, if you're more into functionality and you want fast print outs and exceptional print out quality, there are other suitable laser printers out in the market.